..|... Knight in Shining Armor ...|.. Strength: Slightly above average in human form. Stamina: Slight above average in human form. Intelligence:Average intelligence level for a young man of 20. 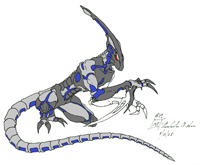 Physical Description: Caleans has the physical appearance of a young man who engages in regular daily excercise.His spine is always cover in layered metal panels; this is the main area of armor projection. 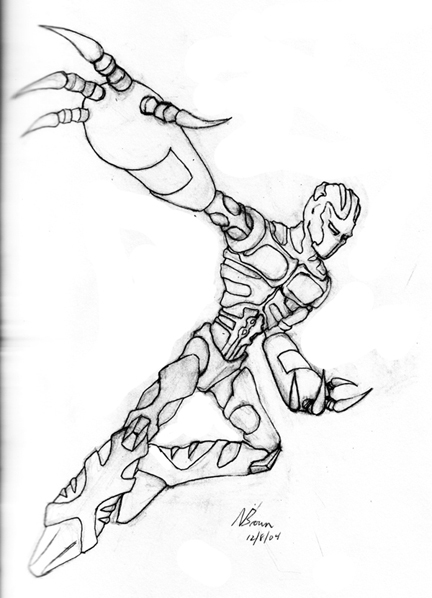 Mutant Abilites: Caleans body can generate a Bio-synth armor made from a crystalline structured, reinforced - Osmium like structure. Mass increase: Weight increase to 350 lbs. Acid Proof: unaffected by acid. Heat Tolerance: Can withstand temperatures up to 9,000°F. Invulnerability: Unable to be harmed by melee, weapons fire, or explosie attacks. Water Proof:Can be fully submerged underwater with no side-effects. Psychic Shielding: Invisible to psychics while in armor resulting in immunity. Light Refraction:Able to conciously bend light away from his body enough to create a camoflaging effect that is near invisible under non-direct lighting situations. Physical Boost: Strength, speed, and agility are boosted to peak human levels. Dia-magnetic: Bio-synthetic armor composition results in immunity to magnetism. Talons: Fingers in armored form can be changed to beyond razor sharp talons that can cut through most materials. Statis Lock: Armor has a stasis like effect on the body. All injuries are effectively "on hold" until the armor is removed. Mass increase: Increased height to 7 feet tall, weight in armor to 600 lbs. Heat Tolerance: Can withstand temperatures up to 15,000°F. Light Refraction:Able to conciously bend light away from body to create invisibility. Physical Booost: Strength, speed, and agility are boosted past peak human levels. Speed: Max run speed of 60 MPH. Strength: Can lift a maximum of 2 tons of weight. Wrist blades: 2.5 foot long blades extending from both wrists. Blades are not inherently sharp like talons. Ability to cut is created by a micro-vibrational effect on the blade that lets them slice through materials. Blades can fold flat against the lower arm or extend to be 90° with forearm. Tail: Fully prehensile tail. Can be used to manipulate objects, tail has pointed end which can be used as a spear, can move extremely fast in a whip like fashion. Calean is an average joe from an average family. His parents divorced when he was 5, causing some subconscious resentment, which in turn may have given birth to a second personality named Cyrus. 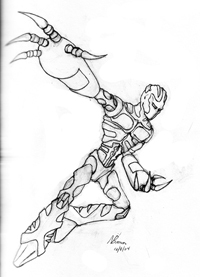 Cyrus is extremely aggressive and forceful, and currently has full control of Caleans mutant ability. Caleans powers first manifested during an argument with his parents. Cyrus, tired of Calean giving into his parents ways, activated Caleans armor. As Calean stormed from the room, he swung at the wall and tore scratch marks into it. Then Cyrus took control of the body and attacked his step-mother causing her to be hospitalized for deep laceration wounds. Calean was kicked out by his father. From this point on when Cyrus emerges, the body transforms into the synth-armor. Having no idea how to control his powers, Calean could only watch helpless as the other personality did what it wanted. Cyrus Seems to have a natural control of Caleans powers, as if he already knew how to use them. Now homeless, Calean wondered looking for a place to stay. Having no money or means to take care of himself, Cyrus, using Caleans powers began to terrorize local business, stealing and inflicting pain on those he wanted. Calean became frightened and confused and had no way of stopping Cyrus. After a story aired on the news about a mutant terrorizing a small town in Connecticut, a mutant woman who identified herself as Emma Frost approached Calean telling him about her school and how he could be helped. Calean has discovered how to control his armor, learning that it is a physical trigger. By compressing his diaphragm, the part that is attached to the spine causes the armor to project outwards from its home there. Cyrus, having known this all along, has taken to the habit of causing trouble for Calean, framing him on numerous occasions. Assault on both students and teachers has landed him in the Academy's detention level under a maximum security lock down for a period of just over 2 months. After much persuading and questioning by his girlfriend Eleanor Rigby and several teachers, Calean has finally confessed to the existence of Cyrus. Freed from prison, he began to focus his time and work on solving his problem with Cyrus. After a year of steady therapy with Ms. Frost and a fellow teacher, he came to realize that Cyrus was the manifestation of his fears; his anger, frustrations, and fears of what he had done with his armor. Through acceptance and hard work he over came his fears and accepted his armor as a gift, and thusly defeated Cyrus. Working hard in both his studies and training to prove himself, he eventually earned a recommendation to be placed on a Mass. Academy X-Team to further his skill, experience, and his effectiveness in combat situations. But things aren't always peaceful at the Academy, and an attack by a rogue sentinel of unknown origin attacked the school, in the process kidnapping several students. As the sentinel fled Calean arrived on the scene, and risking his invulnerable hide, he single handedly took down the sentinel. This act alone proved he was ready to be an X-men. From that point on he was a key member in both rescue operations for field teams and the Academy's defense.